The history of the industry that provides sleeping quarters is not totally devoid of Black Hotel Owners. Black-owned and operated hotels have existed since pre-turn of the century. James Wormley (1819-1884), born free in Washington, is best known as the owner and operator of the Wormley Hotel, which opened in 1871. Wormley was one of a number of entrepreneurs in the hotel and other service trades with downtown businesses. The hotel catered primarily to wealthy and politically powerful white males in the city. The five-story Wormley Hotel contained a bar, a barbershop, and an acclaimed dining room where Wormley served European-style dishes using fresh ingredients he grew on his nearby farm. Wormley, who had spent time in Europe honing his culinary skills, was a consummate entrepreneur, attending to minute details to ensure the pleasure of his guests. The hotel is also famous as the site of the Wormley Conference of 1877, when representatives of Republican Rutherford B. Hayes and Democrat Samuel J. Tilden brokered a deal over the contested presidential election of 1876. The eventual result was the Compromise of 1877, which led to the removal of troops from the South and the end of Federal Reconstruction. Wormley's parents were Lynch and Mary Wormley, both also free born. After Wormley's death in 1884, his eldest son, James T. Wormley, managed the hotel into the 1890s. It was taken over by new owners and renamed the Colonial in 1897. The hotel was later razed, and the Union Trust Company building was constructed on the site in 1906. The renowned Hotel Theresa in Harlem was a vibrant center of black life in Harlem, New York City, in the mid-20th century. The hotel sits at the intersection of Adam Clayton Powell Jr. Boulevard and Martin Luther King, Jr. Boulevard (better known as 7th Avenue and 125th Street). It opened in 1913 and was from then, until the construction of the Adam Clayton Powell Jr. State Office Building across the street in 1973, the tallest building in Harlem. It has a striking white brick facade and was known as the "Waldorf Astoria of Harlem." From the time it opened until 1940, the hotel accepted only white guests plus a few black celebrities. This changed when the hotel passed to new management. Louis Armstrong, Sugar Ray Robinson, Lena Horne, Josephine Baker, Dorothy Dandridge, Duke Ellington, Muhammad Ali, Dinah Washington, Ray Charles, Little Richard, and Jimi Hendrix all stayed in the Hotel or lived there for a time, as did Fidel Castro, while in New York for the 1960 opening session of the United Nations, after storming out of the Hotel Shelburne because of that hotel manager's "unacceptable cash" demands. Castro's entourage rented 80 rooms at the Thersa for $800 per day. The hotel profited from the refusal of prestigious hotels elsewhere in the city to accept black guests. As a result, black businessmen, performers, and athletes were thrown under the same roof. After leaving the Nation of Islam, Malcolm X maintained his competing Organization of Afro-American Unity at the hotel and hosted meetings there. He met Cassius Clay in the hotel on various occasions. Bill Clinton's commerce secretary, Ron Brown, grew up in the hotel, where his father worked as manager. U.S. Congressman Charles Rangel (D-Harlem) once worked there as a desk clerk. The hotel may have enjoyed its greatest prominence in 1960. Nikita Khruschev visited New York in that year, during the week when Castro was staying in Harlem, and came to meet him in the hotel. Also, in October of 1960, John F. Kennedy campaigned for the presidency at the hotel, along with Eleanor Roosevelt and other powerful figures in the Democratic Party. The hotel suffered from the continued deterioration of Harlem through the 1950s and 1960s, and, ironically, from the end of segregation elsewhere in the city. As black people of means had alternatives, they stopped coming to Harlem. The hotel closed in 1967. After remaining vacant for four years, the building was converted to office space in 1971, and now goes by the name "Theresa Towers," though a sign with the old name is still painted on the side of the building, and the old name is still commonly used. It now serves as an auxiliary campus for Teachers College, Columbia University. The building was declared a landmark by the City of New York in 1993. South Division Street and Baltimore Avenue, Ocean City. Formerly known as "Henry's Colored Hotel," this building is a prominent historic site in Ocean City. Reportedly erected during the last decade of the 19th century, the three-story wood-shingled structure is one of the oldest hotels in the city and the last hotel that served black visitors to the ocean resort during the early to mid-20th century. Reserved periods, known as "Colored Excursion Days," were limited to days after the main summer season. Charles T. and Louis Henry bought the hotel in December 1926. After Charles T. died in 1942 the hotel was held by his wife and then his son, Charles Wesley Henry. Duke Ellington, Cab Calloway, Count Basie and Louis Armstrong were guests of Henry's Hotel in the days when black entertainers could perform in major hotel ballrooms, yet not sleep in the hotels. In the early seventies, eighties and nineties there were only three hotels in the United States that were franchised and part of a major hotel chain. The first was a Holiday Inn in Tuskegee, AL that opened in the early seventies and later became the Tuskegee Inn before going out of business. The second was opened by Mabra Holeyfield and Frank Banks as the Benchmark Hotel in 1983 and became the Days Inn in 1988. That hotel was sold in 2008 to NABHOOD’s Chairman, Mike Roberts and will be converted to a Clarion Collection. The third was the 105 room Travelodge Hotel when an investment group led by the city’s first African American mayor and businessman Harvey Gantt, purchased a bankrupt hotel and cafeteria in the heart of Charlotte’s African American community. After a two million dollar renovation, the hotel opened in July 1998. There were a few flagstones with small hotels like the first Black owned hotel in the nation’s capital, Howard Inn, that opened as the Humbree House in the early eighties. The Eureka Hotel, the two-story, red-brick Victorian built in 1885 became an upscale hotel in the early 1930s, making it the city's oldest African American hotel. Now its owners are willing to donate it to anyone who wants to restore the building allegedly housed guests such as Duke Ellington, but no one knew about the house's history until construction signs went up in early January, prompting residents to find a way to save the historic structure. Located two blocks away from the National Civil Rights Museum, the hotel operated until the 1980s, when Irvin Landsky bought it and turned it into a rental property. When he died in 2001, his daughter, Cheri Rudner, and her husband, Henry, inherited the Eureka Hotel and decided to demolish the house. • In 1895, Colonel Wesley Redding, a bank teller, entrepreneur and the first Black resident of Auburn Avenue east of Boulevard (where the MLK family home was located) opened the European Hotel in time to accommodate Blacks attending the Cotton States Exposition in Piedmont Park that year. The hotel opened three years after the Atlanta City Council passed an ordinance making segregation legal. • In 1901, Katie McBride opened the Mackie Bee Hotel, said to be the "only colored hotel in the city." An advertisement indicates that rates are $1 to $2 per day and boasts of being "up-to-date and first class, completely furnished and meets every requirement of a strictly modern and first class hotel." It was located at 115 Houston St., at the corner Piedmont (Citizens Trust Bank is located on that corner today). • In 1913, J.H. Hawk opened the Hawk Hotel near the Old Union Shed on Central Ave. Advertisements in The Atlanta Independent, a weekly-Black-owned Atlanta newspaper, boasted of the "hot-and-cold bath" features. • In 1921, The McKay Hotel opened in the newly built Citizens Trust Bank Building on Auburn Avenue. In 1949, the name was changed to the Hotel Royal, which was purchased by entrepreneur Carrie Cunningham who also purchased the Top Hat Club in 1949 for $31,000 and renamed it the Royal Peacock. • In 1924, Alonzo F. Herndon built and opened the three-story Herndon Building on Auburn Avenue at the corner of Butler Street. Among its offices and shops was the James Hotel, which was operated by Mary Walker James and her husband. • In 1937, C.M. Pearson opened the Savoy Hotel in the Herndon Building after the James Hotel closed. It is said that hundreds gathered outside to see the Savoy sign light up on Auburn. The hotel’s ballroom became popular for its twice-weekly dances and was a favorite spot for club and fraternal functions. • In 1951, developer Walter A. "Chief" Aikens opened the Waluhaje (a collection of the first letters of his children) building on West Lake Avenue in northwest Atlanta. The building was actually one of the first apartment-hotel sites and became popular for its ballroom featuring top jazz talent. • In 1957, two new motels were established. O.T. Bell built the Bellview Hotel at the corner of Auburn and Piedmont (which later became the Palamont) and the University Motel on Northside Drive near MLK Jr. Drive. The hotel featured a small tavern, that became known as the Town Club. Rumor has it that the hotel was secretly financed by singer Ray Charles for a friend. • In 1959, the three-story Danzig Motel opened on Chappell Road in northwest Atlanta. • In 1967, James and Robert Paschal opened a five-story, 120-room Paschal’s Motor Hotel adjacent to their restaurant. In 1996, the complex was sold to Clark Atlanta University for $3 million. • In 1975, a group of Black businesses formed the National Hotel Acquisition Corp. and purchased the 425-room Atlanta International Hotel for somewhere between $6 to $7 million. Within a year, the AIH owners were filing for bankruptcy protection under Chapter 11. • In 1979, the Empire Real Estate board unveiled plans to build a hotel at Interstate-20 and Ashby Street. The plan stalled due to lack of available financing. • Feb. 8, 1995, The Atlanta Journal and Constitution carried a front-page story on plans by several African-American business leaders and the Vine City Housing Ministry to build a 225-room hotel on Northside Drive just across the street from the Georgia Dome. The story included an architectural rendering and costs of between $12 to $15 million. Listed as owners were developers Real Property Solutions, a Black-owned firm, the Vine City Housing Ministry and Johnny Moore, owner of the parcel where the hotel would be built. George Hawthorne, president of Real Property Solutions, told the newspaper that they envisioned the facility "would be under the downtown hotel market but less expensive, more quality and service oriented." The project never got beyond planning. For almost six years, the city of San Augustine has made efforts to renovate the Lewis Railroad Hotel. The hotel was built in 1870 and provided a safe haven for African Americans at a time when public facilities and neighborhoods were still segregated. “We've been trying to preserve it, because it is very important history for Texas and San Augustine,” said Mayor Leroy Hughes. According to Hughes, the historic building is the only African American hotel still standing. “African American people would come back in the early days, because African American citizens could not stay in regular hotels,” Hughes said. Also during railroad construction in the early 1920s, African-American railroad workers stayed there. Many changes have been made to the building, but high winds from Hurricane Harvey caused a tree to uproot and fall on the hotel. “It tore down the chimney, most of the west wall, including a gable, and a big piece of the roof,” said City Manager John Camp. Because of this incident, extra funds have been used; that's why officials are asking for donations to continue with the renovation. “There's going to be about a $15,000 deficit between funds that are available and what we need to finish the restoration on just the outside of the hotel,” Camp said. 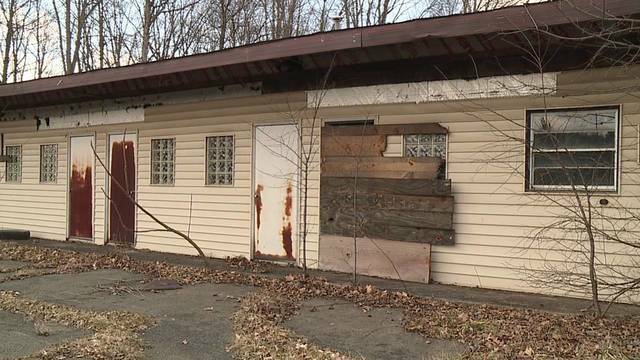 There are plans to create an African American museum, park, and walking trail when the renovation comes to an end. “Hopefully we can get the funds to renovate the inside and have a great monument in San Augustine,” said Hughes. Officials said they want to recreate the look that was previously there in 1870. Once renovation on the outside is complete workers will start to make upgrades inside. A GoFundMe page has been created for donations towards the hotel. YOUNGSTOWN, Ohio (WKBN) - During the 1930s through the 1960s, there was a book called the Green Book. It helped black people find establishments across the country that would serve them, one of which is a motel on Youngstown's east side. A movie was even made called "Green Book." It was about a black recording artist traveling in the south during the 1960s who used the Green Book. If any black recording artist traveled to Youngstown from the 1930s to the 1960s, there was a good chance they stayed at the Wee Motel on McGuffey Road. "In part because it was recognized as a place that was not only black-owned but it was black friendly," said Lewis Macklin, a neighborhood historian. The Wee Motel printed its way into the Green Book along with other hotels, restaurants and night clubs that would accept black people. "There were so many places that were closed to African Americans," said Sean Posey, who studies the history of the Green Book. Posey saw the movie back in 2018 and says they left some information out. "What they don't mention is that the Green Book was needed just as much in the north," he said. According to Posey, Ohio had establishments that didn't serve or allow black people. If you stopped at those places on your trip, it could cost you your life. "So you really needed a book like this to get around," Posey said. "I remember the Wee Motel back in its hay day," Macklin said. Macklin has lived near the Wee Motel his whole life. "African Americans knew that it was a place that they could get good quality, safe lodging," Macklin said. "You would park and then you would just pull up and take your key and then just go into your room." Being a part of the Green Book in the 1930s through the 1960s came with rules that everyone in the community had to follow. "You see nothing, you say nothing and you respect those people who are patronizing," Macklin said. "It's been forgotten about almost until recently," Posey said. ...but its history stands tall. Posey says there is a nation-wide movement that wants to go around to different cities and figure out how to mark the establishments as historical landmarks or preserve them. He says the Wee Motel would take a lot of money to renovate but they hope they can preserve it.